VoiceOver is the screen reader included with Mac OS X. 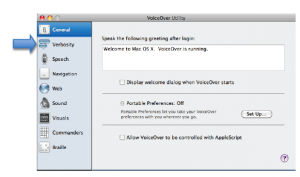 This tutorial covers how to use the keyboard to open the VoiceOver Utility and change VoiceOver preferences while VoiceOver itself is active. Press Command, F5 to activate VoiceOver if it is not already active. Press Control, Option, F8 to open the VoiceOver utility. Use the Up and Down Arrow keys on your keyboard to navigate the categories on the left side of the VoiceOver Utility window. Once you have selected a category, press Control, Option, and the Right Arrow key to move to the first tab in that category’s pane. Pressing Control, Option and the Right Arrow key will move you to the next tab in a category’s pane, and pressing Control, Option, and the Left Arrow key will move you to the previous tab. To select a tab and, press the Space Bar while the tab has focus. To move to the first label or control in a tab, press the Tab key on your keyboard. Pressing Shift, Tab will move you to the previous label or control. Checkbox or radio button: press the Space bar to make a selection. Pressing the Space bar a second time will undo the selection. Popup menu: press the Space bar to show the list of options for the menu, then use the arrow keys to navigate these options. To make a selection, press the Space bar once the desired option has focus. Sliders: once the slider control has focus, press the Left and Right Arrow keys on your keyboard to change the values for the slider.